With new residential windows installed on your home in the Fort Walton Beach, Florida, area, you’ll surely improve the curb appeal and energy efficiency of your residence. Majors Home Improvement is the local authority for window installation in the Panhandle region, and we’ll be pleased to complete this important home improvement project for you. We install our line of Majors Select™ Vinyl Windows that operate efficiently in all weather conditions. They are also warranted against rotting, rusting, cracking, warping, pitting, corroding, blistering, and peeling, which means you can count on long-lasting durability year in and year out. Our complimentary design consultations go above and beyond the typical home improvement consultation. Our knowledgeable team members educate our customers on our residential windows and help them design the perfect windows for their homes. We quote a fair price from the start, and encourage our customers to seek out comparison quotes. Why? Because we know that we offer the best value for windows, bar none. Every installation is completed quickly, but with meticulous attention to detail. Our craftsmen are factory trained and certified, and they will expertly install your residential windows so that they perform perfectly for a lifetime. Additionally, we’re proud to stand behind our residential windows with a double lifetime warranty covering the materials and the workmanship. With Majors, you can expect exceptional protection for your investment. 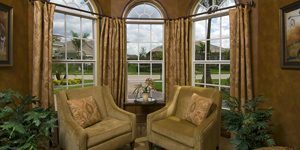 Ready for new residential windows for your home in the Fort Walton Beach, FL, area? Contact Majors Home Improvement today to schedule a complimentary in-home consultation at your convenience.